Sorry, another very basic blog, relying on kindle again as laptop is in for repair. I will edit this post ASAP and add pictures (and here they are). This week was a change to the advertised format – we had to fit in the Dublin Crystal which was confirmed after the diary went to press. Thanks to Jean White who acted as starter this week. And out on the course – Alicia might have won more majors than anyone but even she can have a bad day……………. the 8th is out of sight as she plays from down near the 4th……. Barry, have you lost anything apart from a hat?……………………. remember that picture of Barry Answer trying to walk on water – looks like he parted the waves here and played out of his boots………………. Friday September 9th is Ladies Day. 1pm on the putting green for non-golfing ladies. Prizes and sponsorship from Jan and Jeff at the Condado Club. Evening event at Hispano restaurante. Bus, entertainment and barbeque dinner 17.50 euros -see Alicia. Next week is the monthly Apollo Air. The 35e deal with buggy ends on September 1st. More jokes from the fringe…………….. I can’t exercise for long – when I get back my girlfriend asks if I’ve forgotten something……………. I think we should change the name of type 1 diabetes and type 2 diabetes to ‘not your fault diabetes’ and ‘mostly your fault diabetes’. It was 2 hours before I realised my pot of herbs had gone missing – I thought, no way…….. where’s the thyme gone? My dad’s was an army engineer specialising in clearing minefields – he always wanted me to follow in his footsteps……. And that’s it this year from the Fringe…………….. This week we played the popular 4 person scramble, where it is not often that your bad shots count! There were 48 players but some teams only had 3 members – but we managed to shuffle teams about so every team had 4. It was hot out there, about 39 degrees………….. This was our fun day, and the competition was fun. We had a sponsor for the event, Adrian Clark and his wife Heather, and they provided the prizes. Unfortunately they were unable to attend the prize presentation as Adrian had a medical appointment. Everyone was so close. Not often it is won with 60 plus. Kev, Neil and Chris – Les was building himself up for Man U match……. As reported last week we are holding the auction for our ‘Help For Heroes’ charity over the next few weeks. The items auctioned this week raised our total to over 3000€, and still growing! Ken, Alicia and Neil run the auction……………. Not much to report this week, so here are a few photos of the day………………..
Des Reid tees off on the first………………. Jack Walker at the 11th……..but a non-watery grave………. Gert Willumsen putts for birdie on 13………but it didn’t drop……….was this the hole that cost us the trophy? Tim Beisiegel has a short wedge to 18 after Jack Walker’s fine drive………..
Des enjoys a well earned drink on the terrace……. Tim and Paul Harrington join him……………..
With the lake on 11 now empty, we searched for Barry Answer’s England hat, but no sign – it must have dissolved……………. An interesting happening in the Al Kasar this week – just a bit windy. but one of the tall palm trees near to the supermarket and La Cata decided it had had enough, and toppled over and went through the supermarket window – luckily no one inside was injured. Next week is another 4 person team event, with 2 scores counting at par 3’s, 4 count on par 4’s and all count on par 5’s. There was too much to put on the normal weekly blog, so the golfing information went on Sunday’s, and details of the fund raising today. This year’s charity was HELP FOR HEROES, and an awful lot of effort was put in by the fund raising committee (Ken & Alicia Saunders, Neil Simpson and Kevin Smith). Help was also given by Martina Alwell (golf day starter), Sue Perry, Heather Hurren, Kerry Henry (raffles & collections) and also Lynn Simpson who did the above tasks plus taking on the role of auctioneer. This auction will take place at the Friday presentation over the next few weeks. Martina Alwell made her debut as starter, and did a great job………. 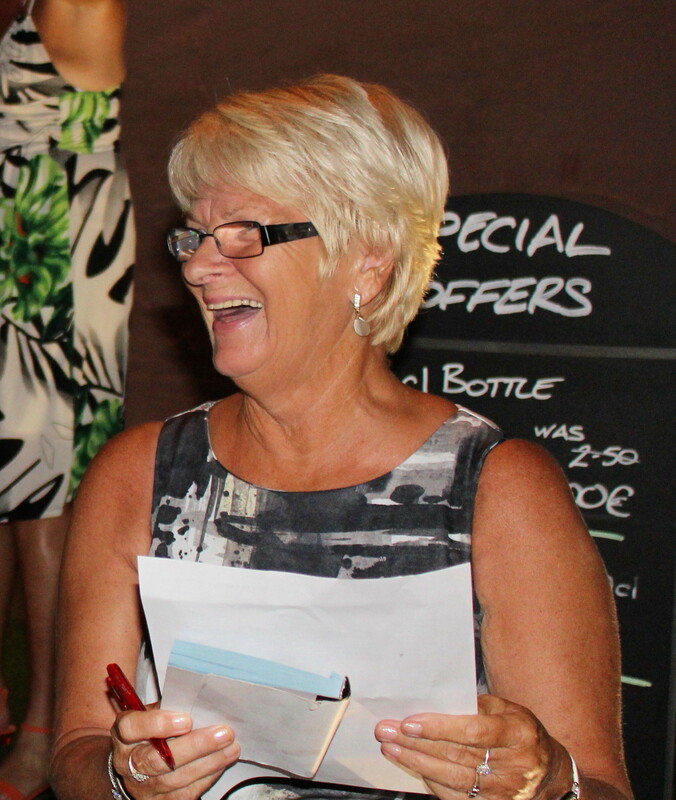 the raffle girls…….Lynn (master of ceremonies), Kerry, Sue and Alicia……. Lots of donations were deemed too valuable to go into the raffle, and on a busy night in the Al Kasar it was impossible to be heard over the noise from the DJ, who wouldn’t stop his music for 15 minutes (well I suppose lots of people would rather hear that than the raffle/auction). So the auction has been delayed and will take place over the next few Fridays after the golf presentation. It was really hard work for the girls trying to get donations for this worthy cause, but most of the fiesta revellers just weren’t interested. Also very disappointing that La Cata Bar refused to contribute anything. Their reason was that the society do not support them – I can assure you that that is not correct. Every time I walk by I see someone from the society in there! But a big thank you to all the businesses who donated some very welcome prizes, which can be seen in the list below (especially the Clover Bar who are our base and were the main sponsor of the event). Apart from the businesses lots of individuals contributed either prizes for the raffle or sponsored a hole. And obviously we are grateful to everyone who bought raffle tickets and threw their change in the buckets. Paddy McKee looks happy to part with his money!……………..
At the present time the charity have already got nearly 3000€ in the pot, with the auction items still to be sold. 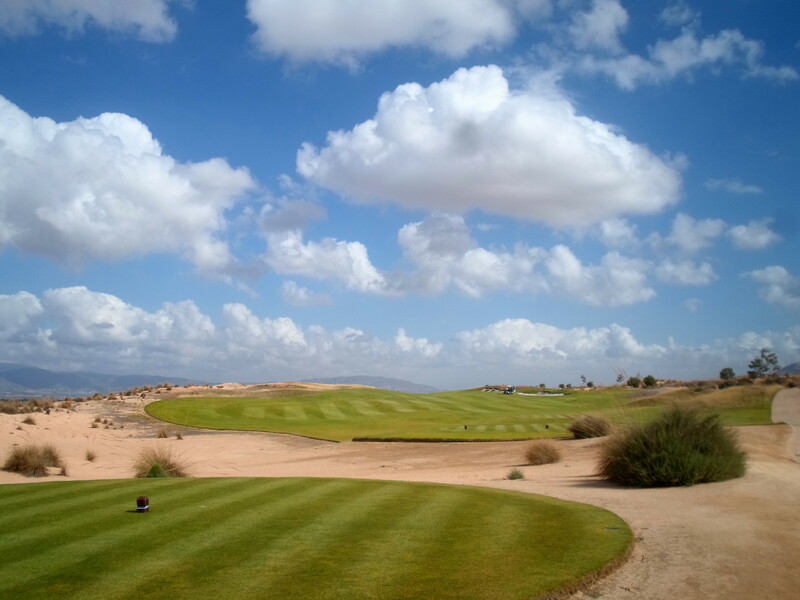 Maybe August is a bad month for this event with many of the committee away, and the vast numbers on site not really interested in golf or British charities (two of our beneficiaries have been for the Lorca disaster fund and Seve Ballesteros). Also two years were for our own on site CPR, which was emergency medical assistance for all residents and guests on site (whatever their nationality). A few more photos of the evening……………. Kerry was like the magician’s assistant – pulling rabbits from the hat?…………. Chris McAllister (owner, Clover Bar) does some market research – Ken, Alicia, Sue & Lynn get to taste 6 wines to decide which is the best up-market brand to serve in the Clover – it’s a wonder they could talk later………..
And here are the winning raffle numbers for those who didn’t see them Sunday………………..
And here is the complete list of hole sponsors……….. sorry Stuart Legg, you were missed off the original list. Also Chris Allen – thought you were Doreen’s friend, just said Chris! Another missed off was Decklid, who provides a motor repair service for many of our members. but all your sponsorships are very much appreciated. First tee…….a reminder what the day is about, and as on every hole recognition of the hole sponsor………. The sum raised (above) is just indicative of the final total – still some more to come! Thanks again to everyone who helped to raise a fantastic amount for the HEROES! Ian presented with his trophy by Alicia and Ken Saunders……….. The Seve Trophy is our annual charity day, but it must not be forgotten that it is a very important fixture in our golfing calendar. There were 40 players in the championship, with another 5 playing as guests. The numbers were rather disappointing considering it was a major at the height of the summer, and Alicia was the only lady in the competition so no ladies prize which we had planned for. 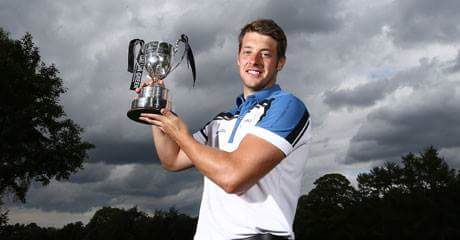 Ian Murnin took the title, the first time a player from Northern Ireland has won a major trophy since the society was founded. His 39 points was the only score below par, with the rest at least 3 shots behind. this year’s champion, Ian Murnin……………. Dave came close to the 1st division prize but also won nearest the pin on 17……………. Jeff is always around the prizes…………..
well done Kev, 1st place in div 2…………..
Sausage Dave is playing well, just 3rd place this week……. 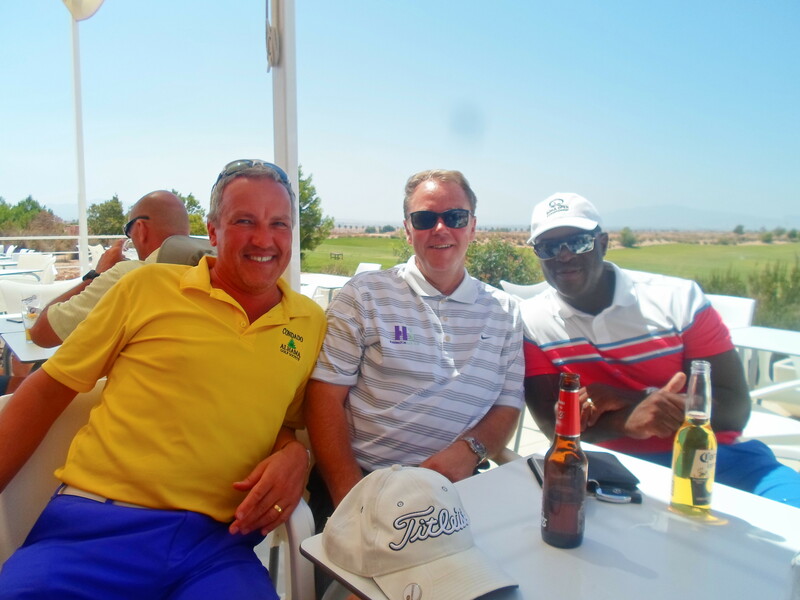 And a few pictures from the golf ………………. an unusual sight on the course – clouds…………..
putting on hole 10 is Anthony McNally watched by Kevin Nicol and Dave Knight……………. It seems that the course has changed hands again, the new owners are GNK? Investment is needed to bring the greens back to their former glory, and it goes without saying that the lakes must be filled to attract golfers. a sad sight on the 11th, no water……………. and as a result hundreds of balls are left exposed in the dried mud………..
Just a quick update that the charity day has raised 2965€ at the moment, with auction items still to be sold – an excellent effort, thanks to the organisers, sponsors and donors of prizes. Too much to put on one blog, so there will be another next week (possibly Tuesday?). And for those who couldn’t hear outside the Clover, here are the winning numbers. And here are the hole sponsors – sorry you were missed off Stuart, but your contribution is as important as everyone elses. And here are the auction items which will be available on Friday in the Clover. Now back from my holidays, so the blog will be back to normal, with results and news. This week was the August Apollo Air and had 64 players out there in hot, but windy conditions. Scoring was difficult, but Norwegian Sissel Hagen left the men in her wake with a fabulous score of 41 points. Another Norwegian lady, Ylva Johnsen, took the ladies prize after a 3-way tie on 34 points. 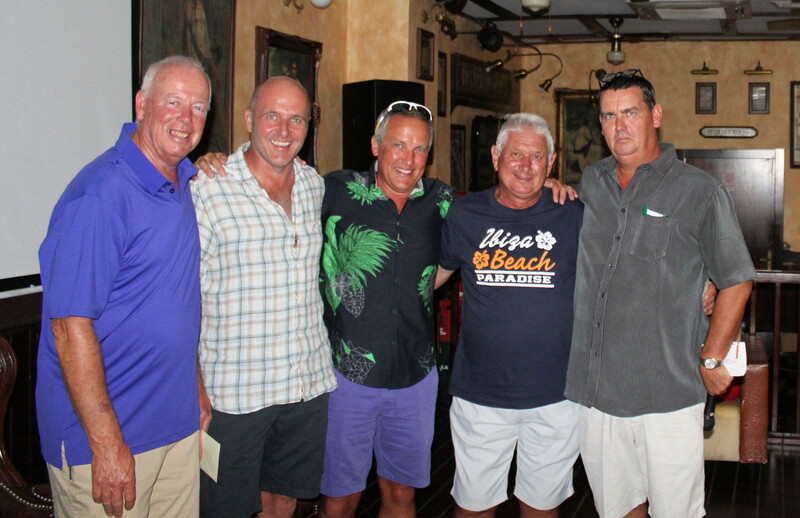 not often that Ken & Neil are shortest, but Hans dwarfed them…..
Tom Toner finally got his prize for his hole in one a few weeks ago……………. Poor Kevin Smith – after asking Jim Alwell if his buggy was in the way and Jim saying no, Jim managed to inflict a severe bruise on Kev’s calf with a full-blooded 5 wood while he was sat in his buggy minding his own business! Fran Thomas found a wasp problem in one of the bunkers – he didn’t want to mess with them and picked his ball up! Next week is our annual charity event, the Seve Trophy, inaugurated 5 years ago to mark the passing of Spain’s greatest golfer Seve Ballesteros. Various charities have benefited over the years, and this year we support ‘Help the Heroes’. Commonly known within the Society as Seve Day, we take the opportunity to raise funds for a very deserving charity and this year it is no different. There will be fund raising events all day and all night long including raffles and bucket collections. If you see Lynn and/or Alicia in the square, please don’t be shy, put your hand in your pocket and help fill the buckets. It is your chance to help make a difference to the men and women who have put their lives and limbs on the line to help make OUR world a better and safer place to be. All the money raised on the day from the Golf Society entry fees and the different events throughout the day will go to Help for Heroes. So please do your bit to support this very worthwhile and wonderful charity. Lots of companies and individuals have donated a multitude of prizes for the raffle – a full list will be included in next week’s blog. Entry next week will be 5€ as a one-off, and the presentation will be at 8pm on Friday so that we can continue through to the entertainment. The event will coincide with Condado fiesta week – the Al Kasar should be buzzing! We have all standards of golfers in the society, from beginners to professionals. Over the last couple of weeks there have been notable triumphs for 2 of our pros – Matty Webb won the English PGA assistant professional title, with Freddy Harrington coming in a creditable 18th. But Fred won his own title the week before – we are very proud of both the lads, they deserve to succeed. Mathew wins Galvin Green PGA National Assistants at Little Aston, Sutton Coldfield. Shooting 69, 66, 69 for 12 under total. As well as receiving a cheque for £ 5,000, he qualifies to play in the PGA of Australia National Futures Championship at Ballarat Golf Club and the National PGA Event in Turkey where the winner qualifies to play in the European Tour event at Wentworth 2017. He now gets a Clothing Sponsorship from Galvin Green. He is still looking for a main sponsor if anybody or any company is interested. Fred Harrington, another of our members wins on the professional circuit……. Fred Harrington (Rochford Hundred) is in good heart after victory in the Ingrebourne Valley Par 3 Championship. The Essex ace edged a three-way play-off thanks to some thrilling golf as he pipped Ian Campbell (Cheshunt Park) and David Salisbury (Three Rivers G&CC). The trio all tied at four-under-par after 18 holes, one clear of former European Tour and PGA Tour player Paul Curry. All three men parred the opening two play-off holes before Campbell appeared to hold the upper hand at the third in extra time. The Scot fizzed an iron close but before he could hole out for birdie, Harrington chipped in for a two. Salisbury could only make par, leaving just two men standing. Playing the ninth, Campbell missed the green but couldn’t replicate his opponent’s previous feat with his own chip. That left the door ajar for Harrington to roll home a 10-footer and claim a first PGA in England (East) title. It was nice to see Tim Beisiegel back with us this week, he has not been here for 12 months as he battled health problems, but it is great that this excellent golfer (and person) back in the sun with his many friends. Looks like we had squatters on the 10th fairway, 9pm Sunday night. Couple laid on the grass for 30 minutes while their dog ran around loose! Again, I wasn’t here last Friday, so just the results this week. I am now back, but in Benidorm when others are golfing this week, perhaps may be there for the presentation later. Chris won division one, but looks like Paddy McKee put up a good fight……..
Next week is another individual, August’s Apollo Air competition. see that the marshall has a new buggy – we want one…………. and a new toilet on holes 6 and 14 for the ladies….. Sorry if this week’s blog is brief, but I am out of the country again for a couple of weeks. shows that a 3 man team can win with the provisions allowed to make them competitive…………. Finally we pinned our ex-greenkeeper Jonathan down to give him the collection from the members a couple of weeks ago……..think it was about 170€ to help him on his way to France………. Jonathan with Kevin and Neil……………..
Just to fill the page, maybe these will cheer the guys up! Next week’s blog will be short on content also.